The illegal use of e-cigarettes has surged in North Phoenix and Anthem high schools, and even in middle schools—part of what the Food & Drug Administration now calls a vaping epidemic across the country with serious health risks. Deer Valley Unified School District just updated its drug policies to battle the problem and promises suspensions and a push for criminal charges and fines. And drug-sniffing dogs are on the prowl. “We have noticed a significant increase in the use of e-cigarettes by students on our campuses this year,” DVUSD Superintendent Curtis Finch said in a letter to parents last week, announcing new drug enforcement policies. It’s against DVUSD rules for any student, including those who are 18, to possess or use tobacco products on campus. E-cigarettes are considered tobacco products. While the problem is most prevalent in high schools, “vaping is occurring” in middle schools, too, said Scott Warner, the district’s director of school operations and athletics. Meanwhile, students have brought vaping from the bathrooms to the classrooms, using small electronic devices teachers and parents may not even notice. E-cigarettes use a battery to heat a pod of liquid (commonly called “vape juice”) that produces an aerosol (the vapor). Some devices resemble regular cigarettes. Others look like a standard pen or a portable USB drive. Larger devices with tanks are called “mods” and look different still. The pods can be bought separately and can deliver other liquid drugs, including marijuana. “Some kids do it just to fit in, and others do it because they like the buzz,” said a 17-year-old Boulder Creek High School student we’ll call John. The boy, who asked not to be identified for this article, estimates about 40 percent of the student body vapes. Another Boulder Creek student put the figure higher. Among U.S. students in middle and high school, vaping surpassed conventional cigarettes in 2014 as the most common tobacco product, according to the FDA. 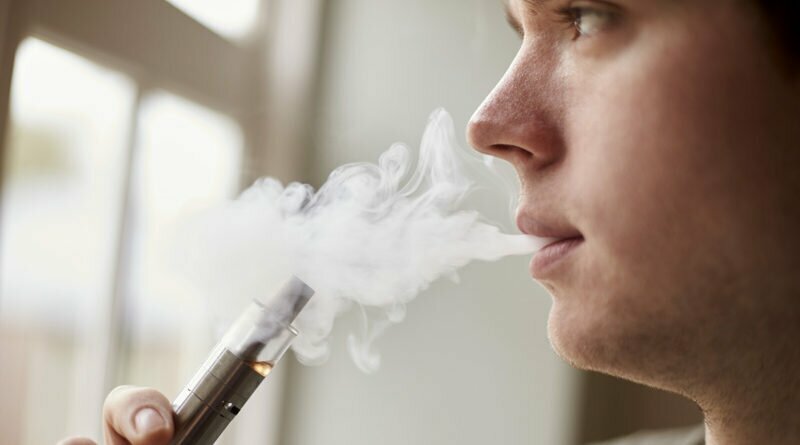 A comprehensive national survey conducted in early 2017—still somewhat early on in the vaping craze—found 27.8 percent of high school seniors reported vaping in the year prior, and 16.6 percent had vaped in the previous month. Among eighth-graders, 6.6 percent said they’d vaped in the previous month. The most popular vaping dispenser, Juul, looks like a USB drive and comes with colorful vape-liquid pods in a variety of attractive flavors. Procuring the goods is easy, John said. John says he and a few friends don’t vape, either for lack of desire or concern over the health risks. But he worries about others. “Some kids are extremely dependent on vapes and have become addicted,” he said. Vaping is not just a DVUSD issue. Some students at Anthem Prep, a high-performing charter school known for its strict discipline on everything from haircuts and gum-chewing to shoe brands, are partaking, too. A recent grad confirmed seeing students vape in the Anthem Prep bathrooms last year. Under state law A.R.S. 36-798, a minor in possession of tobacco or tobacco products (including cigarettes, chewing tobacco or vaping products) “is guilty of a petty offense,” a misdemeanor that carries no jail time. Those convicted are subject to a minimum fine of $100 or 30 hours of community service. Selling or giving these products to a minor is also a petty offense. Drug-sniffing dogs can now be used “for random searches in common areas like student parking lots, locker rooms, or hallways,” Finch wrote. The minimum suspension for first-time vaping offenses is three days, Warner said. Meanwhile, teachers have become “the first line of defense” in spotting e-cigarettes and reporting to administrators, Warner said. And teachers have needed some education since the vaping craze took off about three years ago. “A lot of teachers didn’t realize what they were looking at when they saw them,” he said. The FDA has developed anti-vaping health campaigns aimed at youth via social media. DVUSD plans to include vaping education into its health curriculum, Warner said, but to date, the focus has been on deterrence through increased detection and threat of suspensions and fines. It may all be having an effect, along with some students simply deciding vaping isn’t for them. “Way more people try it and decide they don’t want to do it all of the time than those who end up vaping often and getting addicted,” Jane said. A Juul vape dispenser and pod.